Mushroom species can vary wildly, from the spotted amanita muscaria to the edible Lentinula edodes, or shiitake, mushroom. However, there are some features common to this diverse species that set them apart from other lifeforms on Earth, such as their caps, their growth, and how they reproduce. On the same note, some mushrooms look similar enough to trick humans into thinking they are safe for consumption, while, really, they contain deadly toxins. Most mushrooms have a stalk, also called a stem, and a cap, which is generally disc-shaped. On the underside of the cap — especially in edible species you find at the supermarket — you may see a series of closely spaced slits, called gills; alternatively, this space can be occupied by pores. Mushrooms vary greatly in both size and color, and some of them, such as puffballs, don't conform to the stalk-and-cap shape. The parent organism of mushrooms, called a mycelium, lies beneath the soil, and a single one of these can cover as much as 1,500 acres. Mushrooms can flourish in a variety of places — on lawns, near or on the surface of plants, in compost heaps or in your garden. Because they lack the vascular systems of animals and plants to transport water and nutrients, they must grow in damp environments. 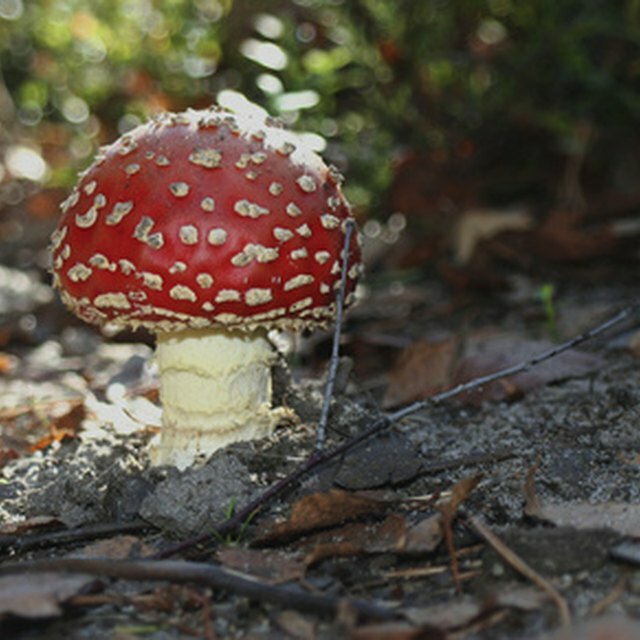 Most mushroom species have either no effect or a beneficial effect on nearby plants. Some are decomposers of plants, notably of wood; for this reason, people often cultivate them on purpose. Other species, however, can only grow in the presence of certain plants and conversely, and the relationship between the two is classified as a "mycorrhizal" one. Some species, such as Armillaria and Marasmius, can be harmful to the plants in their midst; for example, the mycelia of certain offenders can block water from reaching the roots of plants with shallow root systems. Just as flowering plants produce pollen or seeds, mushrooms generate spores. In fact, dispersing these microscopic elements is the sole reason the mushroom portion of the fungal organism even exists in the first place. A single mature mushroom can create up to trillions of individual spores, which manifest as the fine dark dust coating the gills or emanating from puffballs. Most mushrooms come from one of two phyla, Basidiomycota or Ascomycota. The main distinction between these is the manner in which their respective spores develop. "Basidios" are more common and include all mushrooms with gills many of which are familiar edible mushrooms, such as the shiitake. "Ascos" on the other hand have spores contained in tiny cup-like pockets called asci. One type of mushroom, Amanita phalloides, is responsible for the majority of mushroom-ingestion-related deaths in humans and is appropriately known as the common death cap. Unfortunately, this plain-looking specimen bears a strong physical resemblance to a number of harmless species. In addition, some types of mushrooms, including numerous species in the genus Psilocybe, can produce hallucinations and other effects on the brain; although none of these effects are believed to be long-term, the possession of these is illegal in the U.S. and other parts of the world. Crystal, Mike. "Characteristics of Mushrooms." Sciencing, https://sciencing.com/characteristics-mushrooms-8308611.html. 19 April 2018.